Mahendra Bhandari - Wolfsohn Accounting and Advisory Services, Inc.Wolfsohn Accounting and Advisory Services, Inc.
Mahendra was born in Rajasthan, India and moved to United States in 2003. He graduated from Jai Naraian Vyas University of Jodhpur with a Bachelor of Commerce in Accounting. He became a Chartered Accountant in 1998 in Bombay, India. He passed his Certified Public Accountancy exam in the State of Colorado. 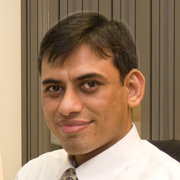 Mahendra’s dual certification offers our clients the benefit of his accounting experience on two continents. He handles individual, trust, corporate and partnership tax returns and specializes in working with QuickBooks. While working as a Senior Accountant with various NY based accounting firms, he was responsible for the accounting, payroll, taxation, cash flow & risk analysis and management reporting. He has over fifteen years of experience practicing auditing, taxation, financial planning, pension and retirement planning in public and private sector firms.